On our drive home from Florida, we stopped in Asheville. Both my grandmother and my grandfather were from North Carolina, and it was wonderful to visit with my aunt and uncle and great uncle and many cousins. During our visit, I was able to ask about some “mountain words” that I couldn’t find defined using Google. The words “mountain branch” and “spring branch” are often used in “The Education of Little Tree”. My aunt explained that a “creek” had running water–it didn’t dry up in the summer. A branch may not always have running water. And a “spring branch” was fed by a spring in the mountain. This paragraph had me laughing. Actually, the whole chapter kept me smiling. Especially this segment. Most of the definitions from this chapter are about the trees, nuts, and mountain flowers of the Smokey Mountains. p. 47: bee gum – from Wikipedia. Nyssa sylvatica’s genus name (Nyssa) refers to a Greek water nymph; the species epithet sylvatica refers to its woodland habitat. While these trees are often known as simply “tupelo”, the fuller name black tupelo helps distinguish it from the other species of the tupelo genus (Nyssa), some of which have overlapping ranges, such as water tupelo (N. aquatica) and swamp tupelo (N. biflora). 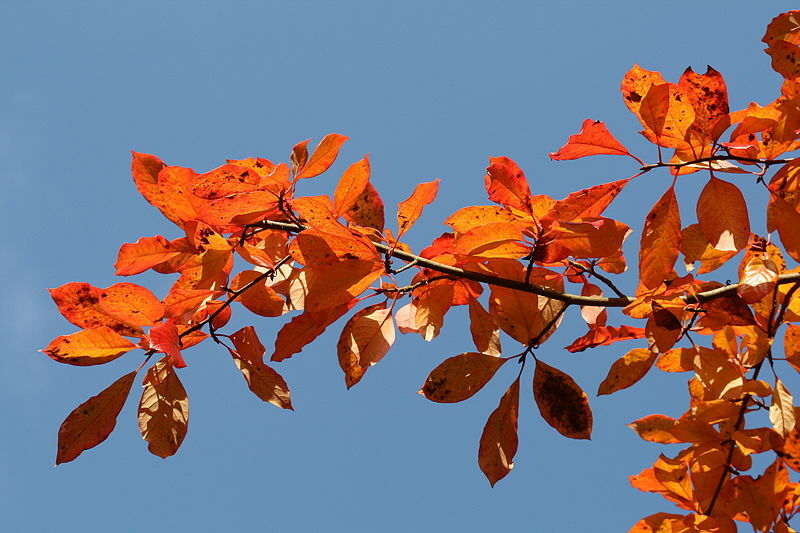 The name “tupelo” is used primarily in the American South; northward and in Appalachia, the tree is more commonly called the black gum or the sour gum, although no part of the plant is particularly gummy. Both of these names contrast it with a different tree species with a broadly overlapping range, the sweet gum (Liquidambar styraciflua), which does produce an aromatic resin. Another common name used occasionally is the Northeast is pepperidge. p. 47: sumach bushes – From About.com. First some identification is in order. It is easy to distinguish poison sumac plants from their non-poison sumac relatives (discussed on Page 1), if you pick the right time of year. The time to make the identification is in the fall, when the berries have ripened to maturity. Poison sumac tree has white berries in autumn, and the berries hang down. Non-poison sumac trees bear red berries in the autumn, and their berries grow upright. In addition, poison sumac plants grow in swamps, whereas non-poison sumac plants prefer precisely the opposite habitat — soils that are well-drained. If you don’t hang around swamps much, your chances of encountering poison sumac are pretty slim. It should be noted that by “non-poison” I allude to an absence of skin irritation from contact with the plant; but no part of the sumac plant should be ingested by anyone not thoroughly informed on the subject. So don’t run away scared at the mention of “sumac.” Poison sumac is in a distinct minority amongst the sumacs. The remaining sumac trees (as in the picture to your right) not only produce no poison, but provide spectacular autumn color. It can be rather surprising to learn that all the sumacs (both poison sumac and non-poison sumac trees), along with poison ivy (for photos of which, see my “Pictures of Poison Ivy” gallery) and poison oak, belong to the cashew family (Anacardiaceae). Also in this family, in addition to cashews themselves, are pistachios and mangos. All three of these foods produce allergic reactions in some people — a fact that is perhaps easier to understand, once their connection with poison sumac is noted! “The raw cashew nut is enclosed in a tough, leathery shell that contains caustic, toxic substances including cardol and anacardic acid” and must be processed before it becomes edible, states the Living and Raw Foods Web site. Even the berries of sumac (the non-poison sumac varieties, that is, with which the remainder of this article deals exclusively) have been used as a food product in a number of cultures. Floridata, an online plant database, points out that Native Americans made a drink from sumac tree seeds “which tastes like lemonade and has a high vitamin C content.” As Gernot Katzer remarks on one of his “Spice Pages,” sumac tree seeds contain citric and ascorbic acids. It is these acids that furnish them with the tanginess by which they can serve as a citrus-substitute. Katzer also mentions the ancient Romans’ use of sumac tree berries to produce sour accents in their cuisine. But sumac’s use as a spice is not relegated to the distant past. It is also used in modern Middle Eastern and Greek cuisine. For instance, in Greek restaurants, it’s the spice sumac” that is sometimes used in wraps. To learn about more uses of sumac (other than poison sumac, which you should avoid), plus its one drawback, continue on to Page 3…. 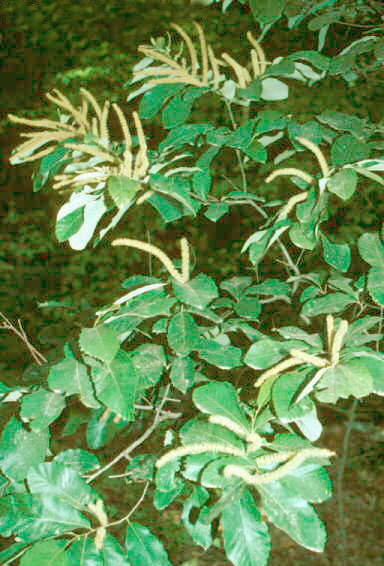 p. 47: yellowroot – from Wikipedia. The Yellowroot (Xanthorhiza simplicissima, syn. X. apiifolia) is the only member of the genus Xanthorhiza, and one of very few genera in the family Ranunculaceae with a woody stem (the other notable example being Clematis). It is native to the eastern United States from Maine south to northern Florida and west to Ohio and eastern Texas. The genus name as well as the common name refer to the plant’s yellow roots (xantho- meaning “yellow” and rhiza meaning “root”), which was used to produce a yellow dye by Native Americans. The species name refers to the simple (not branched) root. In the wild, it grows on the edges of streams in sandy soil under a canopy of dappled sunlight. In cultivation, it is often provided with more sunlight so that the fall colors are more vivid. It is a subshrub, reaching 20-70 cm (rarely 90 cm) in height, with stems up to 6 mm diameter. The leaves are spirally arranged, 10-18 cm long, each divided into 5 toothed leaflets, and flowers emerge only from the upper portion of the unbranched stem. The flowers are produced in broad panicles 6-20 cm long, each flower small, star-shaped, reddish brown to purple brown, with five petals. Yellowroot propagates asexually by sending out many underground runners, and it reproduces sexually with seeds. Yellowroot is comparatively rare in British gardens, although E.H. Wilson and E.A. Bowles are among distinguished plantsmen to have championed its merits. It was grown by Bowles in his garden at Myddelton House, near Enfield, Middlesex, and gardens that currently cultivate it include the Savill Garden at Windsor, Berkshire and the Westonbirt Arboretum near Tetbury, Gloucestershire. Wilson, who regarded yellowroot as one of the best plants for hardy deciduous ground cover, also described (in 1923) its use in the Arnold Arboretum at Harvard University in Massachusettes. Yellowroot is considered an endangered species in Florida. It is cultivated for the stunning fall color, which is a dark red to purple, and lasts for months. While yellowroot is toxic in large doses, a reason why deer do not eat it, it has been used to adulterate or as a substitute for Hydrastis canadensis. Native Americans made a tea and drank it for ulcers in the mouth and in the stomach. It may have also been used as a tonic, and externally on sores. Native Americans also used it to treat various skin ailments. According to Foster & Duke (1998), the plant contains berberine which is anti-inflammatory, astringent, hemostatic, antimicrobial, anticonvulsant, immunostimulant, uterotonic and can produce a transient drop in blood pressure. In addition it stimulates the secretion of bile and bilirubin which may be helpful in cirrhosis of the liver. 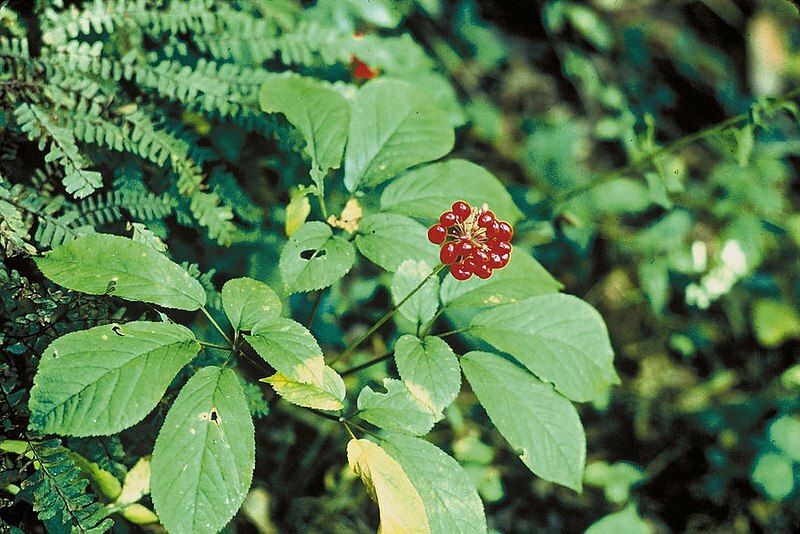 p. 48: ginseng – from Wikipdeia. http://en.wikipedia.org/wiki/Ginseng This link has some interesting information about the medicinal properties of ginseng. p. 48: iron root – Help. I couldn’t find anything. p. 48: sassafras – from Wikipedia. The dried and ground leaves are used to make filé powder, an ingredient used in some types of gumbo. The roots of sassafras can be steeped to make tea, and were used in the flavoring of traditional root beer until being banned for mass production by the FDA. Laboratory animals that were given oral doses of sassafras tea or sassafras oil that contained large doses of safrole developed permanent liver damage or various types of cancer. In humans, liver damage can take years to develop and it may not have obvious signs. Along with commercially available sarsaparilla, sassafras remains an ingredient in use among hobby or microbrew enthusiasts. In 1960, the FDA banned the use of sassafras oil and safrole in commercially mass-produced foods and drugs based on the animal studies and human case reports. Several years later, sassafras tea was banned, a ban that lasted until the passage of the Dietary Supplement Health and Education Act in 1994. Sassafras root extracts which do not contain safrole or in which the safrole has been removed are permissible, and are still widely used commercially in teas and root beers. p. 48 – lady’s slipper – from Wikipedia. Lady’s slipper – a perennial herb growing 1-2 feet tall. The stems bear oval leaves up to 8 inches long. A solitary yellowish to purplish-brown flower (April-June) is borne at the tip of a long stalk. One of the petals is transformed into a yellow pouch like structure (the “slipper”). The bright yellow, moccasin like lip of the flower makes lady’s-slipper easy to recognize when it blooms in spring. Wildflower lovers seek out this beautiful orchid; but with the shrinking of American forested areas, they find that lady’s-slipper, like many other native orchids, is increasingly rare. The value of lady’s-slipper is due to more than its decorative qualities, however, for it has a distinguished medicinal past. American Indians used a boiled extract of the roots for calming the nerves, and early settlers found that an extract was a good substitute for the garden heliotrope, or valerian, that women and children in particular had used as a sedative in Europe. They began to refer to the plant as American valerian. By the mid-19th century, American doctors were prescribing the root for such ailments as hysteria, delirium, irritability, headache, epilepsy, and neuralgia. It was reported that lady’s-slipper was superior to opium for inducing sleep and that the herb was not narcotic. Today herbalists recommend lady’s slipper as a sedative and an antispasmodic. Due to its scarcity and cost, lady’s slipper is now used on a small scale. A sedative and relaxing herb, lady’s slipper treats anxiety, stress-related disorders such as palpitations, headaches, muscular tension; panic attacks, and neurotic conditions generally. Like valerian, lady’s slipper is an effective tranquilizer. Lady’s slipper reduces emotional tension and often calms the mind sufficiently to allow sleep. Indeed, its restorative effect appears to be more positive than that of valerian. Lady’s Slipper is one of the most widely applicable nervines that we posses in the materia medica. Lady’s slipper will help elevate the mood, especially where depression is present. Lady’s slipper can help in easing nervous pain, though it is best used in combination with other herbs for this purpose. Lady’s slipper is perhaps at its best when treating anxiety that is associated with insomnia. Lady’s slipper is native to eastern North America. Its natural habitat is woods and pastures, but due to overharvesting, lady’s slipper is rarely found in the wild. Lady’s slipper is cultivated to a limited degree. Lady’s slipper is poorly researched, but it is known to contain a volatile oil, resins, glucosides, and tannins. Infusion: pour a cup of boiling water onto 1-2 teaspoonfuls of the root and let infuse for 10-15 minutes. This should be drunk as required. Tincture: take 1-4 ml of the tincture three times a day. p. 48: chinkapins – from Wikipedia. This photo is from here http://www.empirechestnut.com/catalog.htm.